The countdown is on: Tuesday brings the launch of Axios Space, a new weekly newsletter covering the latest in the trends, business and science of space. Driving the news: Axios' Amy Harder reported yesterday that the SEC granted ExxonMobil’s request to throw out a shareholder resolution urging the oil giant to disclose targets for steeply cutting emissions. "The differences among API members on the key issue of climate are vast. That’s going to reach a breaking point," he tweeted. Markets: "Oil rose to almost $70 a barrel in London, a level last breached in November, as global crude supplies tightened while hopes for an end to the U.S.-China trade impasse lifted financial markets," Bloomberg reports. LNG: Via Reuters, "French oil and gas major Total SA and U.S. company Tellurian Inc have signed deals supporting the development of the proposed $30 billion Driftwood liquefied natural gas (LNG) project." Saudi Aramco: The Financial Times has a nice package of charts, culled from Saudi Aramco's bond prospectus, that provide context for the state oil giant's production, profits, costs and cash flow. The comparative data on per-barrel production costs for Saudi oil compared to other regions is pretty striking. Pipelines: Per the Houston Chronicle, "New York private equity firm Stonepeak Infrastructure Partners bought Permian Basin-focused pipeline operator Oryx Midstream in a $3.6 billion deal." Axios Expert Voices contributor Todd Moss explores the relevance of a USAID Inspector General report that dinged the electrification initiative called Power Africa for overstating its effect by counting delivery of solar lanterns as new electricity connections. Why it matters: Accurate measures of progress are essential for reaching the UN’s Sustainable Development Goal 7: To ensure reliable and affordable energy worldwide by 2030. Although global energy access has expanded, strengthening the measures used to track it could help make a more meaningful impact. By the numbers: Roughly 600 million people in sub-Saharan Africa lack access to electricity at home, according to International Energy Agency estimates. Power Africa aims to support newly installed generation of 30 gigawatts (GW) and to establish 60 million new connections by 2030. It recently reached 10 GW across 120 projects and has helped to mobilize more than $18 billion in new investment. But, but, but: The U.S. government initiative included 8.3 million solar lanterns, which can power hardly more than a single light bulb, among the total 10.6 million connections achieved by the end of 2017. 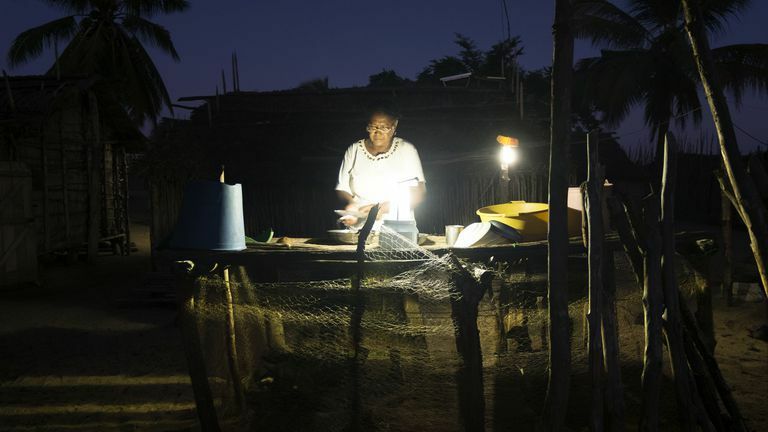 Between the lines: Small systems like solar lanterns are emblematic of the low bar international organizations have set for solving global energy poverty. The IEA considers energy access to be 50 kWh annually per person in rural areas and 100 kWh in cities. By comparison, the U.S. per person annual average is about 13,000 kWh. The UN has adopted this standard as well, but at best, 50 kWh for a whole year will power a few lights and maybe a low-watt appliance, such as a small fan. Moss is executive director of the Energy for Growth Hub and a visiting fellow at the Center for Global Development. The mix of new power generating projects in Africa added by Chinese companies is getting lower carbon as a whole, according to newly updated IEA data. Why it matters: As the Expert Voices piece above notes, electricity access needs in Africa are immense. But a big question is how to expand electrification while holding down emissions increases. And Chinese companies do lots of business in Africa. What they did: IEA looked at projects with Chinese companies as the main contractor over 2 time periods, as the chart above shows. When it comes to coal in particular, there are 3.34 GW of coal-fired capacity additions in the 2010–2020 period, but the Chinese coal buildout has slowed. Chinese contractors finished 5 coal-fired plants in Nigeria, Rwanda, Zambia, and Botswana in the last 5 years. "Some planned projects have been delayed and no others are currently under construction," IEA adds. Go deeper: IEA posted a commentary looking at China’s involvement in the power sector in sub-Saharan Africa. "Another way to look at the scale is that these sorts of numbers are several times larger than the current oil-and-gas industry in terms of volumes. "So essentially we need to build an industry that’s, say, 3 to 4 times the size of the current oil-and-gas industry just to clean up our waste." Who said it: Glen Peters of Norway's Center for International Climate Research, speaking on the new podcast episode from UPenn's Kleinman Center for Energy Policy. Context: He's citing estimates — and not even the highest ones — of the sheer volume of CO2 that may ultimately need to be pulled from the atmosphere using various "negative emissions" technologies. Why it matters: A major UN-led scientific report last year concluded that pathways for holding the global temperature rise to 1.5 degrees Celsius above preindustrial levels all require some level of atmospheric carbon removal. The podcast is a lucid look at the potential for technologies such as direct air capture and afforestation, but also enormous challenges — around land use, ethics, cost and more — facing deployment. Oh, and they can never be a replacement for cutting emissions, Peters emphasizes.